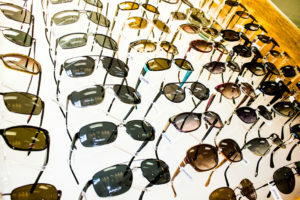 Find a wide array of men’s glasses, women’s glasses, and prescription sunglasses. We carry frames imported from Italy, Germany as well as domestic eyeglasses from all the leading designers. Come in and we will assist you to find the perfect frame for your face shape, lifestyle and budget! Take your time to find just the right pair. Ask about our money-saving deals. Senior citizens get 10% off their frames and lenses and everyone gets 20% off multiple-frame purchases!